Pamoja Charity » The Endau Experience etc. This will probably be our last update while in Kenya. In 48 hours, we should be at Nairobi airport, preparing to fly home. There’s so much to reflect upon, but for the moment we’ll mainly be writing about our trip to Endau. Sheena, our sister-in-law, arrived in Kenya on Monday last week, as we arrived back from our weekend with Tom & Karen at St Andrew’s School. We stayed at Guest House run by a delightful group of Nuns, who looked after us very well, doing everything with a beautiful smile. We spent Tuesday and Wednesday around Nairobi, preparing for the big trip…. Those of you who read last year’s blog will know a little about Endau. 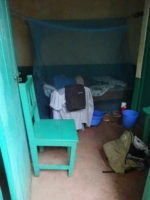 It is a remote town in Eastern Kenya where, a few years ago, Pamoja built a clinic at a village called Kamusa a few miles beyond Endau the request of a gentleman called Shadrach, who was church pastor there at the time. The clinic opened in 2009, but had to close again a few months later when the original nurse said he found the location too remote, and left. Since then, God has blessed us with Stephen, who has worked tirelessly at the clinic since February 2010. He is a dedicated young man who has given his life to serve the needs of the local people, who think the world of him. Many people testify to how he has cared for them: some quite simply owe their lives to him. The journey to Endau from Nairobi is not an easy one. We would not attempt it without having a local person with us, so once again, Kioko, who helps with the education programme in Nairobi, accompanied us. He is of the same tribe as the people around Endau, so speaks the local language, Kamba. Mildred, the manager of the Kware Care Centre in Nairobi, also got out of her comfort zone and took her first trip to Endau with us. We were fortunate on Thursday morning that Nairobi traffic was not too bad, so managed the tarmac part of the trip to Kitui, in just over 3 hours. We found drinks and a half-decent toilet, moved out of the noise of the town for a picnic, then set off on the dirt road. 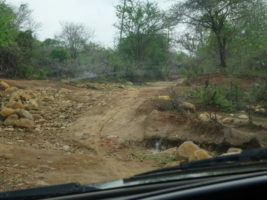 There had been a lot of rain a couple of days previously, but we were told that the road was now passable. Unfortunately, we missed a turning, so had a detour of about an hour which involved fording a river, but eventually reached Endau after 4.5 hours on the dirt roads. At this point, it would be nice to have a hot shower, go for dinner, and sink into a comfortable bed. The establishment that we like to call the Endau Hilton is not quite like that…. degrees (even at night) and the rooms are designed to have no airflow at all. No expense has been made on the mattresses, which are thin and worn out. Laundry facilities: beware of the wire washing line which is at neck height just outside the rooms. Special features include close proximity to wildlife (Richard had a cockroach in his room, Sue had one in her bed,), feeding the wildlife (Sheena was eaten by bedbugs), and natural showers in the rooms – (the roof leaks) – Sheena’s leak was right over the bed. Top tip: don’t stay here under any circumstances. It really is a dreadful hotel in a scruffy town: I don’t think it will be on the front page of the next Kenya Tourist Board brochure. Next time, we have to think of somewhere else, probably sleeping on the floor of the clinic. came because of the novelty of seeing some white faces in the area! A couple of times in the day, Richard spoke to the people who were waiting (Kioko translated), paying tribute to Stephen and all those who work at the clinic, explaining that it is the love of God that motivates everyone concerned, and that although healing our bodies is good, healing our souls is even more important. We also entertained them with some singing, and with balloons and bubbles, which most had never seen before. 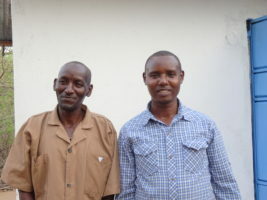 Elijah, another lovely young man who is now church pastor, assists Stephen in the clinic. Together, they make a great team, caring for the physical and spiritual needs of this needy community. 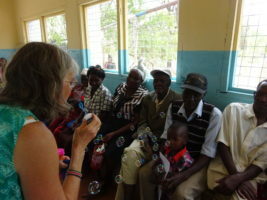 Pamoja is so glad to be able to support this clinic, which is working so well. It is a living example of how Jesus himself came to serve, not to be served. All of us went away, humbled by the way these two young men, along with the faithful Solomon, their night watchman, dedicate their lives to this work. In the evening, back at the grotty hotel, Stephen and Elijah joined us. We chatted in the darkness, then, together with Kioko and Mildred, they sang to us, Elijah’s high voice leading, Kioko’s deep bass providing the foundation, and the others blending in magically. For a few minutes, we were lifted beyond the dirty, depressing surroundings into another realm of beauty and peace. Such times are never forgotten. Despite the overnight rain, the ‘road’ out of Endau was not too muddy and we were thankfully able to avoid another night at the hotel, and make the long trip back to Nairobi. We were sad to leave our friends, but two nights at that place is two nights too many! The journey back was made longer by another of those ridiculous Kenyan traffic jams: two lorries had collided just outside Nairobi, so vehicles were driving in all directions, on and off the road, to try to get round them. Total chaos, but once again we eventually arrived back in Nairobi safely. We pray every time we travel and are thankful to God that we have, thus far, avoided being involved in accidents. Since then, we have been around Nairobi, going to Church with the people where we’re staying on Sunday, meeting up with friends, and visiting another orphanage that Pamoja partially supports at Tala, about a 2 hour drive from Nairobi on Monday. Now it’s a matter of picking up the Pamoja bags to bring home so people can buy them for Christmas, packing, and leaving Kenya, at least for the time being. Politically, there was some trouble around Nairobi airport last Friday, as Odinga’s supporters decided to go there to welcome him home: several people died in the ensuing fracas with the police. On Monday, the supreme court ruled that the election was valid, so Kenyatta will be sworn in as president next Tuesday. So far, things have been fairly quiet after the announcement, but Odinga has said that the opposition does not recognise Kenyatta as president, and they will make a further announcement about what they will do next. Millicent continues to make a good recovery, and is due to return to Kenya on 24th November, a day after we leave! She will rest for a few days in Nairobi before going back to Magina. Please pray that she is sensible about how quickly she tries to pick up everything again: Millicent is not noted for readily taking things easy! Thank you once again for your prayers, your interest and your support.